Although today’s guest was born on the island of Puerto Rico, the streets of Chicago served as the backdrop to his childhood. And still today, he hasn’t forgotten those roots. His newly formed community service outreach aims to combat the prevalent violence found on the streets of Chicago, while also giving back to his fellow countrymen in Puerto Rico. Simply put, today’s guest is one of the true good guys in the sport of boxing. With impressive victories over the likes of Duncan Dokiwari, Bert Cooper, David Izon, and Obed Sullivan, he won the first 22 fights of his professional career. His breakout victory came against then-undefeated Clifford “The Black Rhino” Etienne on Showtime Championship Boxing. He has held the WBC & WBO & WBA Latino Heavyweight belts, and NABF, NABA & USBA Heavyweight championships, making him the only Heavyweight fighter in history to hold all of these titles. He is a three-time World Title challenger, and has been rated as high as #2 in The Ring Magazine, #1 in the IBF and WBO, #4 in the WBA and #3 in the WBC. He’s faced world champions such as Evander Holyfield, David Tua, Oliver McCall, James Toney, John Ruiz, and Chris Byrd. 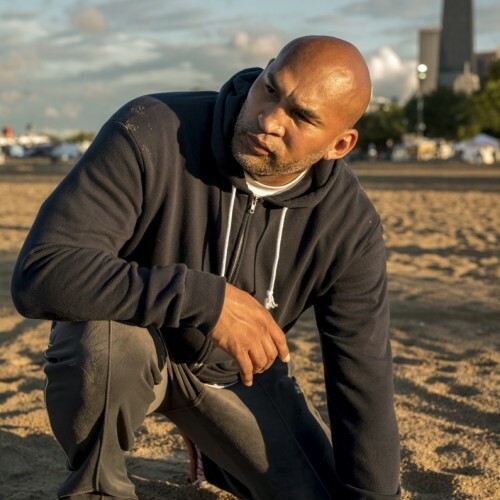 Please welcome to the “Lo’s Gym Blog,” a hero to both the city of Chicago and the people of Puerto Rico — the one and only “Fast” Fres Oquendo. I’ve probably watched all of your televised fights (Showtime, etc.) but I don’t recall ever hearing the genesis of your fight story. How did “Fast” Fres Oquendo find his way to the squared circle? It all started with my brother, Hector Morales. These days he’s a successful attorney here in Chicago but he was boxing at the time when I really fell in love with the sport. I think it was 1986. I was like 12 years old. One day my brother came home with this trophy he won from a boxing match. I admired my brother so much. But it was also that trophy. Looking back, it was the trophy, I think. I liked that trophy more than anything. And, as far as watching boxing on television it was the Leonard vs. Hagler fight. I remember watching that fight and deciding that I was going to be a boxer and win a trophy like my brother. And the story begins in Chicago, Illinois – correct? Hamlin Park. Chicago. I went to the gym and right from the start became good friends with David Diaz. He was my stable-mate right from the beginning. You’ll remember David from the 1996 U.S. Olympic Team. He was also the WBC Lightweight champion of the world. I knew that you and Diaz were Chicago guys but hadn’t heard that you were childhood friends. Still to this day. I literally saw him yesterday. Montell Griffin, another good friend of mine, just opened a boxing gym here in Chicago, called “The Windy City Boxing Gym.” Me and David were there to support Montell for the grand opening of his gym. I’ve met Montell Griffin on a few occasions and there couldn’t be a nicer guy in the sport of boxing. A lot of people don’t know this but Montell Griffin was actually the one who gave me the nickname “Fast” Fres Oquendo. He gave me that nickname when he got back from the Olympics. We’d sparred and he started calling me “Fast Fres” and the name just stuck. You’ve had a very impressive career, fought some of the best heavyweights of your generation. Is there one victory that means the most to you? It would have to be my victory over Clifford “The Black Rhino” Etienne. Everybody was comparing him to Tyson, calling him the next Joe Fraizer. And, he’d beat some impressive guys. He’d beat Clifford Couser (Tyson’s twin), had a big win over Brewster, beat Larwence Clay-Bay. He was on a roll. But they matched him up with me and that was all she wrote. If Etienne was your greatest victory, who was the most difficult opponent you faced? Probably Mo Harris. He was lanky, tall, young. He fired off good combos. He gave you lots of movement. You had to chase him around the ring. He took me out of my element. He made me fight in a style that I wasn’t accustomed to. I’m sure that you don’t remember but we’ve actually met before. My father and I had a chance meet up with you at Mountaineer Racetrack and Casino in Chester, WV before your fight with David Tua. That was a big moment for me as a young amateur boxer, especially since you were accompanied by Felix “Tito” Trinidad and his father Don. I remember the Tua fight in West Virginia very well. That was a tough fight. As for the Trinidad family, I’ve always had a good relationship with Felix and his father. Felix has always been a motivator for me. He’s actually joining to help with my foundation. We want to help the needy people in the mountainous regions of Puerto Rico. They have always cared about the people of Puerto Rico. The needy people. Working with Felix and his father was a blessing. Speaking of your community service activities, tell us about your foundation. The name of the organization is the Fres Oquendo Boxing Academy. Our goal is to knock out youth violence through boxing. We are a non-profit organization that helps inner-city youth in Chicago where the violence is a serious problem. My organization is also offering aid to the victims of the hurricane Irma in Puerto Rico. There are people dying from the drinking water. It isn’t healthy. We want to make a difference on the streets of Chicago. We want to help the needy people in the mountainous regions of Puerto Rico. We want to do some good in the world. You can certainly hear the passion in your voice when you talk about these community service efforts. I want to help inner city youth here in Chicago. That is my focus and my mission. When I retire from the sport of boxing, I want to dedicate 100% of my time to these causes. Let’s end by talking boxing. Your career isn’t over yet. What’s next for “Fast” Fres Oquendo. Well, as I’m sure you already know, I was supposed to fight Shannon Briggs last summer. But, you know what happened. Steroids are a big problem in boxing these days. I think a lot of these guys are on it. So, that fight didn’t happen. My next opponent will be Manuel Charr and it will be for the WBA portion of the heavyweight title. The WBA is now paring with the WBC to assure that fighters are clean and not using anything they shouldn’t be using, which is great for the sport. I don’t know the date or location of the fight because it is going to the purse bid. I hope it is in the states and not in Germany. But only God knows how that will play out. What would a victory over Charr mean to your career? That would be the icing on the cake. The icing on the cake. Frez you and your family are special. It is a honor to call you friend. May the Lord continue to bless you in all your endeavors.